It's self-evident that we cannot possibly understand trade, soaring corporate profits, Facebook's data collection or the economy without understanding the core role played by Big Data in reaping outsized profits and pushing narratives. B) set up a low cost trap that has millions of people handing me for free, and with their acknowledged permission, their preferences, tastes, beliefs, and aspirations . . . which I can re-sell at almost no cost to a long list of buyers, with a price that I can set as I have the data. Why I keep thinking we’ve moved past 'the sky is falling' to 'the sky fell' with this is that we haven’t yet seen what happens when next generation AI gets a hold of this data and starts using it. That’s no concern of anyone in the data mining, acquisition, or aggregation business now - as their goal is very simple: get as much data as possible from any kind of source that you can beg borrow or steal from - as the AI and algorithms of the future will find more and more uses for this data. Data will only become more valuable. I don’t think there is an equivalent 'substance' in our universe, that no matter what happens, the data holder will be wealthier and wealthier. Data doesn’t expire, rust, need maintenance, go in or out of fashion, need to fed, require medical care . . I thought it was very telling that there were numerous reports recently that the Senators grilling Supreme Leader Zuckerberg clearly, by the nature of their questions 1) did not understand what Facebook does and why this is and issue, and 2) didn’t want to piss Zuck off as they are going to need to use Facebook's data in their next campaign, as their opponents surely will." "Perhaps one way to underline this for readers (i.e. that corporations have benefited from "free trade" far more than consumers and workers) is to see what wasn't outsourced and offshored. This is control of the product marketing and distribution channels. This is the sector the "Free Traders" have maintained a death grip on. Even with Alibaba in place the Chinese have still made almost no progress in market penetration in North America, Europe or Pacific Oceania. If we totaled up the proverbial '80%' of retail value in any class of products I'm certain we'd be staring at a series of oligopolies that generally have fewer than ten members in any category, and often fewer than five." Here's how I'm connecting the dots of data collection/data mining and the new model for maximizing profitability: the entire model of "capitalism" (maximizing return on capital and labor) has shifted from getting rich making stuff/providing services to distributing/marketing goods and services in a cartel structure. In this economy, the essential role is played by big data/data mining. Wal-Mart, Amazon, Facebook, Google et al have no interest in where the goods and services are made/generated; the big profits are in the distribution/marketing (i.e. exploiting large data sets) and gathering and selling these large data sets. Let's stipulate that those corporations whose entire value proposition is manufacturing expertise will continue to extract profits from manufacturing. But this doesn't mean that this manufacturing remains exclusively in the domestic economy, or that Big Data isn't increasingly a core value-generator for manufacturers. Boeing is a good example. In terms of trade, it's noteworthy that Boeing is careful to have major airliner components manufactured in major markets for its aircraft: Japan and China come to mind. Since Boeing's value is increasingly based on how well it meets the needs of its airline customers (setting aside its government defense contracts for the moment), then the value proposition shifts to Big Data /data mining and analysis of passengers, routes, etc. by the airlines. Thus Big Data informs what they want from Boeing, and Boeing is thus as reliant on data mining as any politico seeking to exploit large data sets mined by Facebook. GFB made an important point in one of our many email exchanges on these topics: small data sets are a dime a dozen. What's truly valuable is data sets covering tens of millions or hundreds of millions of individuals. There are of course beneficial uses for large data sets: pharmaceutical and healthcare R&D is informed by large data sets about patients and their responsesto lifestyle changes, medications, etc. To Mark's point: to identify what is most profitable, look at what isn't offshored, and what is most zealously guarded by political/regulatory moats. Alternatively, to identify what's low-value and not very profitable, look at what's offshored. That would be manufacturing and assembly. To GFB's point: given a choice between an intrinsically risky enterprise such as discovering and extracting oil in harsh landscapes and unstable nations (pretty much all that's left to explore/extract), and extracting the value from large data sets, which is more profitable and lower risk? 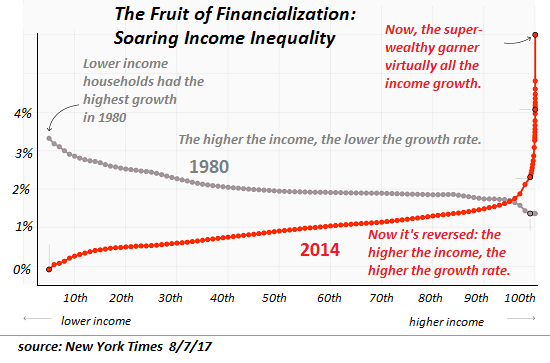 Mark invokes the 80/20 rule (Pareto Distribution) as a basic guideline to the concentration of wealth and power: 20% of the firms in any sector reap 80% of the profit. If we go one step further, and take 20% of the 20% and 80% of the 80%, we get the 64/4 Rule: 4% of enterprises/individuals reap 64% of the profits/income. 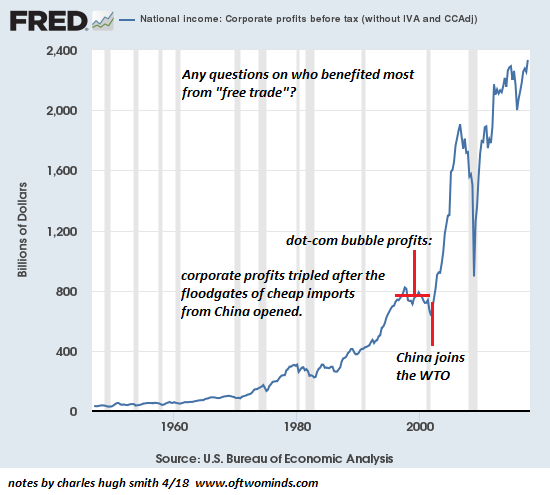 This extraordinary concentration of income and profits is reflected in the data on corporate profits and IRS income data. This connects the dots linking trade, the value of Facebook's "business model," and the tremendous demand by corporations and political campaigns for large data sets that can be analyzed and exploited to market products, services and political narratives/candidates. It's self-evident that we cannot possibly understand trade, soaring corporate profits, Facebook's data collection or the economy without understanding the core role played by Big Data in reaping outsized profits and pushing narratives--in Noam Chomsky's phrase, manufacturing consent. Big Data, Big Government, Influencers / Marketers, Corporate America and politicos never had it so good. As for the rest of us--not so much.